We're not running. He was born and raised here; he wouldn't leave if it weren't for an awesome job opportunity. I just wanted to get some feedback from the people living in Albuquerque regarding this issue. The hostility we have encountered is just very new to me; I grew up in a very liberal area and never witnessed this type of thing before. I was wondering if we should expect it in NM. And yes, it is sad that the issue has spilled over and made it uncomfortable for people of Hispanic descent. Oh, I see. I got the impression you were moving due to the hostile environment in Arizona. Sorry, but I’m not familiar with New Mexico. Good luck. Well, my husband is Hispanic but is 4th generation American... he doesn't even speak Spanish! LOL But he clearly looks Hispanic and since the whole SB1070 controversy we have been met with a certain degree of hostility in Phoenix and comments like "go back to your own country". Sad, but true. So I was just wondering what the atmosphere is like in ABQ. I've read here on C/D. to think of it as a smaller Phoenix. I can't blame you for wanting to leave Phoenix and Russ Pearces National Socialist Movement if you are not Arayan Arizona can be a real challenge. Last edited by Boompa; 09-08-2010 at 03:19 PM.. Your husband is american he has no problem, just like me or you if pulled over for a ticket I have to show id. don't worry we all live by the same laws. That's what I thought, but I tried that and I got moved to this forum. well hope you get some helpful responses here then. Being a non-white citizen or legal immigrant is a challenge in Arizona? What sort of challenges are there? This video had nothing to do with some guy in a Turbin being shot. As for some so-called white neo-nazis supporting Arapaio so what? I have seen many brown reconquistas supporting and being at pro-illegal immigration rallies also. Does that mean that the pro-illegal movement is based on that agenda then? There are both white and brown supremists in every state not just Arizona but they don't represent the majority so why even bring them up? 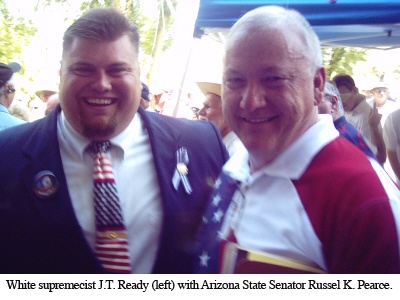 Russ Pearce is the Mojority leader in the State Senate and author of SB1070. I love that they stood and stomped the mexican flag. very good video. See how pissed americans are from the most passive to the radical neos.